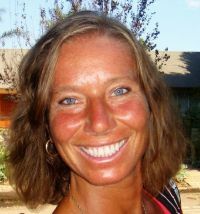 Experienced athletic fitness trainer and expert and competitive tennis player with an extensive knowledge in training, nutrition and injury prevention. Located in Venice Beach, California, Miss Natural Olympia and kettlebell practitioner will help you to achieve your athletic goals and excellence. Focusing on functional training, overall strength, flexibility and balance. "The Ageless Athlete is The One who always strives for improvement and always keep dreaming and believing that impossible is possible, and that the age doesn't set the limits for growth and performance - only your determination, dedication and discipline." Let Suzanna help you to achieve your fitness goals. "Tennis Fitness for the Love of it: a Mindful Approach to Fitness for Injury-free Tennis"
was published in September 2010 and is available on Amazon.com for $14.95, or autographed on TennisFitnessLove.com. The 178 pages with 87 photographs are divided into 64 easy to read chapters that cover all aspects of injury prevention, stretching, strengthening and performance improvement. The book is small enough to carry in a tennis bag for daily study and the increase of body consciousness. A Kindle version for your Kindle device is available for $8.99 and immediate download on Amazon Kindle. An iPad/iPhone EPUB version is available for $8.99 and immediate download in iTunes or Smashwords. An interlinked PDF version with color photograps is available for $8.99 and immediate download on TennisFitnessLove's store. "Two thumbs up!" Excellent job of presenting essential injury prevention material for tennis players of all levels. The stretches and exercises would in fact benefit ANYONE who is active. 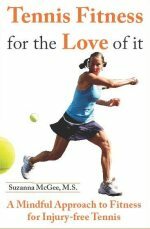 If you like the sample tennis fitness articles, visit the full library at TennisFitnessLove.com. Do you love to play racquetball or squash? Visit www.racquetball-fitness.com for training and injury prevention tips. A Kindle book "Racquetball and Squash: Conditioning and Injury Prevention"
is available on Amazon Kindle for $9.99, or for your iPad/iPhone and Nook, on Smashwords. Since November 10, 1997, you are visitor no.